MCTA has a nine member Board of Directors. Come meet them now. Work for one of the best employers in Monroe County. Our Agency buys things, you sell things. Follow our procurement rules and we may be able to purchase goods or services from you. 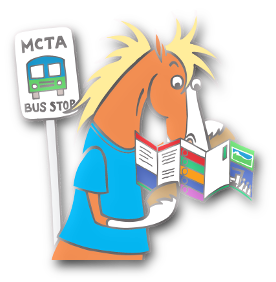 MCTA Board meetings are generally held the last Thursday of each month, 5:30 PM at the Monroe County Transit Authority Administrative Office. These meetings are open to the public and remarks are welcome at the beginning of each meeting. The next meeting of the Board is December 20, 2018 at 5:30 PM. Martha Kitchen was the founder and first Board of Directors Chairperson in 1979. 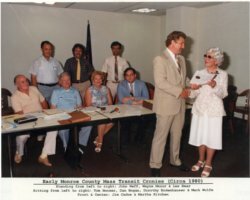 Two of the people in this photo are still active with MCTA today - Wayne Mazur, Vice Chairman and Marc Wolfe, Solicitor. At this time, we apologize that we are unable to accept applications electronically. Download Drivers License Check Form. Instructions: Use the Adobe form to complete the information and then sign the document. This form must be completed by each employee that may require operating a company vehicle. Do not send money with the DL-503 form. No application will be considered if this form is missing. Please fax applications to (570) 839-8205 or mail to MCTA Attention: Human Resources. Download Child Abuse History Clearance Form. Instructions: Use the Adobe form to complete the information and sign the document. The candidate must complete, submit and pay for these form to the proper authority prior to starting at MCTA. The purpose of ePATCH is to better enable the public to obtain criminal history record checks. The repository was created and is maintained in accordance with Pennsylvania's Criminal History Information Act contained in Chapter 91 of Title 18, Crimes Code. This Act also directs the Pennsylvania State Police (PSP) to disseminate criminal history data to criminal justice agencies, non-criminal justice agencies and individuals on request. Criminal justice agencies can access all of an individual's criminal history record information (CHRI). Requests made by noncriminal justice agencies and individuals are subject to edit criteria contained in the law. MCTA receives subsidies from the Commonwealth of Pennsylvania (PennDOT) and the Federal Transportation Administration. As such, procurement practices must be conducted with integrity, consistent with sound business practices and applicable laws and regulations. The procurement process shall provide for fair and open competition among all proposers. All procurements must follow FTA and PennDOT rules. If you are considering providing a good or service to MCTA, please review the attached terms and conditions every vendor must follow (depending on the value of the good or service rendered). MCTA has retained the advertising firm of KKPR of Milford, PA to run its transit advertising program. 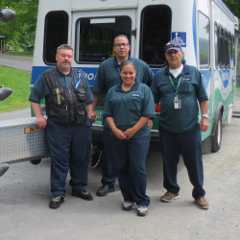 Through the use of interior and exterior transit advertising, Monroe County Transportation (MCTA) offers an ideal mass-reach medium for a low comparable cost to impact the Pocono Mountain's consumers. Your message is delivered in a high-visibility format that can't be ignored by the riders and the general public. 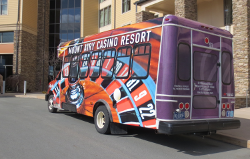 With a fleet of more than 35 vehicles, your message will be viewed by residents and visitors alike throughout the Pocono Mountain region, reaching them at the perfect time; when consumers are out and about. Dominating the out-of-home media, transportation advertising has becomes a pinnacle tool in the marketing mix to increase branding and point-of-purchase advertising while staying within your budget. MCTA seeks qualified candidates to respond to this Request for Proposal for Mitel 5000 and Voice4Net Service and Maintenance Support. MCTA has 25 Mitel 5330 IP Phone endpoints and licenses, a Call Center Suite which includes one license for Reporter Pro and Reporter Real-time applications and 2 conference call units. MCTA also has a Voice4Net IVR / EBS system. The combined system operates on a T1 PRI with 23 inbound / outbound lines. The microprocessor units (Mitel 5000 and Voice4Net servers) are located on a rack in a climate controlled IT environment. Please use this form to let us know that you're interested in this solicitation and would like updates. Please direct any questions for the solicitaion using this form. The RFP guidelines and proposer questions and answers will be provided in this location. This section will be populated with questions and answers as they pertain to the RFP. All questions will be listed and answers given, no information will be provided as to who asked the questions. MCTA seeks qualified candidates to respond to this Request for Proposal for the production of travel training videos. The videos will be in a format accessible on the internet via MCTA’s YouTube Channel and highlight how to help reduce anxiety many disabled and elderly have toward riding the bus. Staff training on how to best provide assistance (ie: sensitivity training, customer service) is also part of this effort. MCTA will select the vendor who provides the best value in the production of the video(s). Selection emphasis will be placed on creativity, cost and the responsibility of the proposer. MCTA seeks qualified candidates to respond to this Request for Proposal for Audit and Consulting Services. In accordance with recommendations from the U.S. Department of Transportation and the Pennsylvania Department of Transportation, the Monroe County Transportation Authority is seeking to obtain proposals from Certified Public Accountants to perform an audit on its state and federally funded transit programs. The initial period to be audited is July 1, 2015- June 30, 2016. The Authority also desires to contract for audit services for fiscal years ending June 30, 2017, June 30, 2018 for a total of three fiscal year periods, with a two year option of June 30, 2019 and June 30, 2020. The audit is to be conducted in accordance with generally accepted auditing standards; government auditing standards, issued by the Comptroller General of the United States; and the provisions of Office of Management and Budget (OMB) circular A-133, audits of states, local governments and non-profit organizations. During the contract period the successful individual or firm shall be required to periodically to review and monitor the Authority’s accounting system to assure that accurate and proper records are being maintained. The successful firm will be required to act as the Authority’s consultant on all matters relating to proper fiscal recordkeeping systems in effect or yet to be created. The ‘Contract for Audit Service’ section explains the scope of work required by the successful bidder. Selection emphasis will be placed on public transit audit experience, cost and the responsibility of the proposer. Are there any major differences between the audit requirements for 2016 as compared to the 2015 audit package provided? The Authorities operations and level of capital projects for FY2015-16 are consistent with the 2015 audit package. The Supplementary information included with the financial statements. 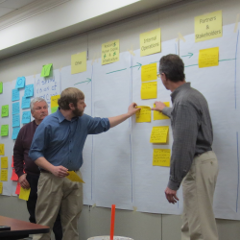 Is it required to be present under a grant or by PennDOT or who? The Supplementary information are reports that are required to be included with our Financial Statements. We supply this information to the auditor and they include this information with the completed Audit Report. There is a reconciliation process between what has been reported to Penn DOT and what the auditors are representing in the Audit Report. Will you provide a copy of the PA Department of Human Services Special Audit report based on MCTA’s MAT Program? Since it is something that must be prepared by the auditor. A copy of the Special Audit Report has been posted in the Documents tab of this section. 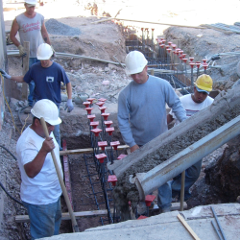 What are the expectations regarding Federal and State Funding for the 2016 year? Higher, lower about the same? Any different or new grants? The Federal and State funding for our fiscal year 2015-16 is about the same as last year. There is one different funding source that we have not had in prior years. It is a Technical Assistance Grant through the State. The State granted these funds to help with the cost of the new transportation scheduling software maintenance that MCTA and other transit authorities use for the Lottery Shared-Ride program. 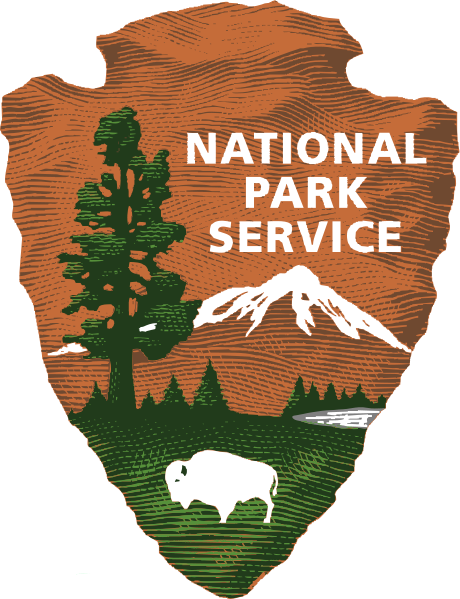 Are the 2016 grants under the Uniform Grant Guidance or under the old circulars A-133 etc.? Yes MCTA is under the Uniform Grant Guidance for Auditing purposes. Will it be necessary to have Transportation Authority experience to be a successful bidder? Transportation Authority Auditing experience is one of several criteria that will be graded for this Request for Proposal. There will be a committee of 5 persons to independently reviewing the proposers based on several criteria. The committee then gathers all grades from each individual and selects the proposer that best fits the interests of the Authority. Did the auditors have any audit adjustments in the prior audit? When are the authority's financial records normally closed and ready for audit? The Authority operates on a Fiscal Year July 1 thru June 30 of the next year. The year end is closed by the last Thursday of July (which is our Board Meeting, and the board approves the June Financial Statements subject to audit.) So the financial records would be ready for audit by August 1st.